Aim. The purpose of this research is a monitoring of the possible deformation processes in the territory of the mining fields of mine No. 2 in Stebnyks potassium deposit using precise tilt meters. Method. Tilt measurements were carried out to find the magnitude and azimuth of the maximum inclination of the territory. The magnitude and azimuth were computed based on measurements and , along corresponding axes X and Y from inclinometers (Nivel 210)were installed in the study area. Results. From December 31, 2017, measurements of the inclination angles were received every second from stations “Modrychi” and “Visyt”, from inclinometers installed in basements of buildings in the Modrychi village, and in the Truskavets outskirts. Every ten minutes those data were automatically written to special observation files. Special software NivelDataCollector has been developed for automated collection and processing of information from high-precision digital inclinometers. The daily values of the maximum inclination angle obtained at the tilting stations "Modrychi" and "Visyt" changed. According to these data, these changes in maximum inclination angle mean velocity and its magnitude and azimuth were computed. Scientific novelty. Scientific novelty consists in the possibility of real time study of the spatial kinematics in industrially dangerous territories based on the results of tilting observations. Practical significance. Obtained tilt measurements results from mine No. 2 of Stebnitsky potassium deposit area allowed to predict possible threats of infrastructure destruction. Haydyn A. M. Vlyyanye tekhnohennoy deyatel'nosty na solyanoy karst [Influence of technogenic activity on salt karst]. Ekolohiya i pryrodokorystuvannya. 2008., issue 11, pp. 42–54. GuljaevJu.P. 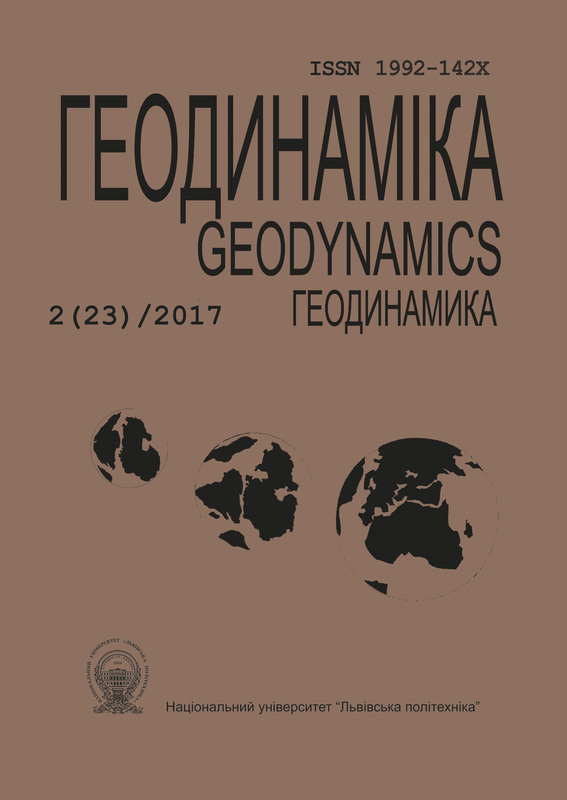 Prognozirovanie deformacii sooruzhenij na osnove rezul'tatov geodezicheskih nabljudenij [Forecasting deformation of structures based on the results of geodetic observations ]: monografija. Novosibirsk: SGGA, 2008, 256 p.
Kabalin E. V., Lohov B. C. Principy vedenija postojannogo monitoringа na geodinamicheskih obektah [Principles of ongoing monitoring at geodynamic objects]. Geoprofi. 2012, no. 2, pp. 58–61. Marfenko S. V. Geodezicheskie raboty po nabljudeniju za deformacijami sooruzhenij [Geodetic work to monitor deformations of structures ]: Uchebnoe posobie. Moscow: Izd-vo MGUGiK. 2004, P. 35. Provallia poblyzu Truskavtsia mozhe zbilshytysia na 50 metriv. Yuliia Devda zaxid.net. 2017. Available at: https://zaxid.net/provallya_poblizu_truskavtsya_mozhe_zbil. Hiller, B. Avtomatizirovannyj deformacionnyj monitoring – innovacionnye tehnologii na sluzhbu obespechenija bezopasnosti v gornodobyvajushhej, neftjanoj i gazovoj promyshlennosti [Automated deformation monitoring - innovative technologies for security services in the mining, oil and gas industries]. Markshejderskij vestnik. 2010, no. 4, pp. 54–58. Hiller Bernd, S. V. Staroverov, Ja. V. Mjasnikov. O vozmozhnosti ispol'zovanija cifrovoj inklinometrii dlja geodezichesko gomonitoringa inzhenernyh sooruzhenij [On the possibility of using digital inclinometry for geodetic monitoring of engineering structures]. Izvestija vuzov. Geodezija i ajerofotosjomka. 2015, issue 1, pp. 34–37. Homonenko A. D., M. Ja. Bran', A. A. Nikitchin. Informacionnaja Sistema geodezicheskogo monitoring deformacij transportnyh sooruzhenij [Information system of geodetic monitoring of deformations of transport structures]. Naukai transport: Modernizacija zheleznodorozhnogo transporta. 2013, no 2 (6), pp 58–60. Arnoso, J., Montesinos, F. G., Benavent, M. &Vélez, E. J. The 2011 volcanic crisis at El Hierro (Canary Islands): monitoring ground deformation through tilt meter and gravimetric observations. EGU General Assembly 2012, held 22-27 April, 2012 in Vienna, Austria., p. 5373. Álvarez-Vigil, A. E., González-Nicieza, C., LópezGayarre, F. &Álvarez-Fernández, M. I. Forensic analysis of the evolution of damages to buildings constructed in a mining area. Engineering Failure Analysis 17(4), June 2010, pp. 938–960. Gikas V, Sakellariou M. Settlement Analysis of Mornos Earth Dam (Greece): Evidence from Numerical Modelling and Geodetic Monitoring. Eng Struct. 2008; 30:3074–3081. Rohrmann, R. G., Thöns, S. & Rücker, W. Integrated monitoring of offshore wind turbines – requirements, concepts and experiences. Structure and Infrastructure Engineering, 2010, 6(5), pp. 575–591. Roberts GW, Meng X, Dodson AH. Integrating a Global Positioning System and Accelerometers to Monitor the Deflection of Bridges. J Surv Eng. 2004; 130:65–72. Sherman, C. S., Magliocco, M. & Glaser, S. D. Developing a Rock Mass Tilt and Seismic Observatory at DUSEL. 45th U.S. Rock Mechanics. Geomechanics Symposium, June 26–29, 2011, San Francisco, California.